The CEO of BuzzFeed wore a hoodie, and BuzzFeed’s apparent head of ad sales used the F-word during the NewFront presentation BuzzFeed staged Monday in New York. These were two of the observations I jotted down during my attendance at this presentation, which was the first such presentation of its kind — a so-called “NewFront” presentation put on by an Internet content company – that I have ever attended in a lifetime of attending upfront presentations staged by TV networks. The hoodie-wearing CEO was Jonah Peretti, who is also BuzzFeed’s founder, a visionary to those who follow the Internet business. I have nothing against wearing hoodies. I just mention it because it was something that struck me as different from what I have long been used to. Network television executives do not appear on stage at their upfront presentations wearing hoodies. Internet executives wear them, though, perhaps in the fear that no one would recognize them as Internet executives if they went out in public without them. 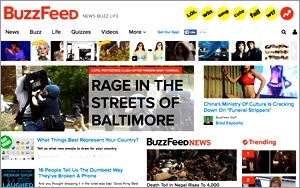 The F-word-using BuzzFeed executive was Lee Brown. His title is chief revenue officer, which at BuzzFeed appears to be synonymous with “chief ad sales guy” because he was the one who made BuzzFeed’s pitch to this NewFront audience of advertising and media people. At one point in his pitch, Brown casually dropped the F-word, as in “What the f---!” I don’t recall ever hearing that word in any upfront presentation I have ever attended. I wasn’t offended per se; just surprised. Another executive had a title that wasn’t quite what it seemed. This was Dao Nyugen, an impressive young woman who holds the title of BuzzFeed publisher, but her contribution to the company’s NewFront presentation was more of a research and technology role – not a sales role like a publisher at, say, a traditional magazine. She introduced a new research product called PROUD, an acronym for Process of Optimizing and Understanding Network Diffusion. It’s a tool that BuzzFeed has developed to dive more deeply into the world of Internet file sharing, particularly where BuzzFeed editorial and video content is concerned. The tool yields far more details about single shares than has ever been possible before, she said. Instead, PROUD assesses “cascades of sharing within each initial share” or, to put it another way, how a single share begets and includes other actions and additional shares. At least, that was how I understood Nyugen’s portion of the presentation. “A social network should be valued by its entire downstream cascade,” Nyugen said. “Sponsored content is shared and reshared just like editorial content,” she pointed out. That statement cut to the core of BuzzFeed’s presentation – that the original, short-form video content it produces and distributes over many platforms in addition to its own can be tailored and produced with specific advertisers in mind. CFO Brown showed some examples of this, including a series of videos sponsored by Luvs disposable diapers that featured parents sharing “war stories” about raising young children; and a video called “7 Things All Couples Do In Cars” sponsored by Ford. As part of this lunchtime presentation – which was held in a spacious nightclub, B.B. King’s, on 42nd Street -- attendees heard from Ze Frank, president of BuzzFeed Motion Pictures, the company division that produces its video content -- about 50 short-form videos a week, Frank told the group. Earlier in the presentation, and several times during it, BuzzFeed President Greg Coleman hammered home the point that BuzzFeed video content averaged 17 million views a month just two years and, today, that figure stands at more 1 billion views a month. More than once, he credited Frank’s production unit with driving this growth. When the presentation was over, the pitch message seemed to be: BuzzFeed has set up a production apparatus that is flexible enough to meet the needs of just about any advertiser, and creative enough to engage with whatever audience segment an advertiser wants to reach. Moreover, BuzzFeed can demonstrate its effectiveness in this area with its own advanced research tools.